Connect with Synergy on Instagram! 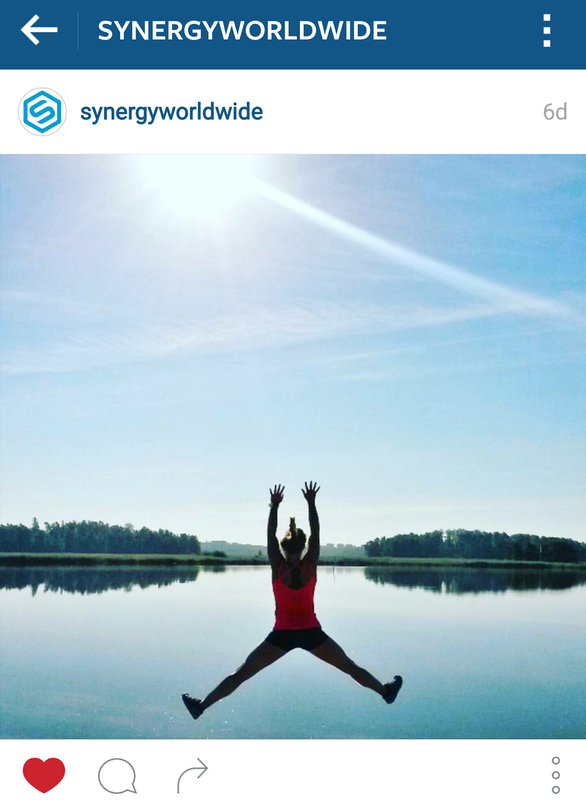 For all things Synergy, follow Synergy WorldWide on Instagram under the account name @synergyworldwide! It is now your mission to go to your Instagram account, search @synergyworldwide, and follow us. We will randomly select Instagram followers for Synergy merchandise and product giveaways. Mention @synergyworldwide or use the hashtag #synergyworldwide in all of your Synergy-related photos and there is a good chance we'll repost them! Find out what fellow Synergy WorldWide customers and Team Members from all over the world are up to. You may even learn a thing or two from them! Similar to our Facebook pages and blogs, our Instagram account is another avenue you can use to stay up-to-date on the latest Synergy happenings. We promise to inspire you to Leave a Legacy with the fun images and messages we post! Don't have an Instagram account? Well, you might want one! Instagram is an online mobile photo-sharing and video-sharing social media service that is connecting more than 300 million people all over the world through imagery. 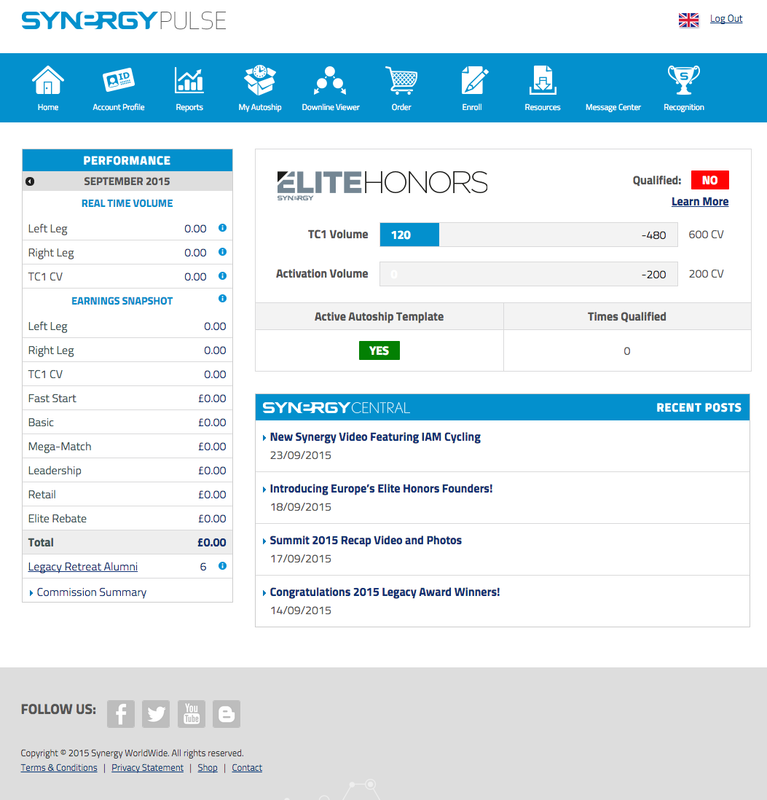 With the launch of Elite Honors, we've created a concise, easy-to-navigate, tracking system on the dashboard of your Pulse account. 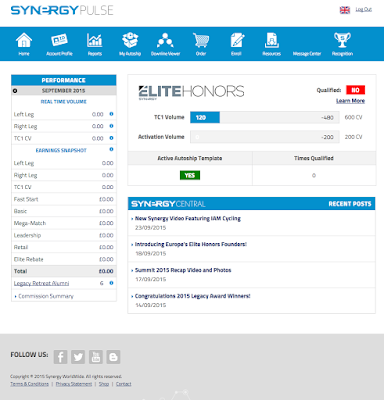 Simply log in to Pulse and you'll notice a new fixture that will help you in your pursuit to become Elite Honors Qualified and maximize your Synergy business's potential. Click the "learn more" button in the top right hand corner for the Elite Honors flier and worksheet document. This document will tell you everything you need to know about becoming Elite Honors Qualified. • Reminder: You need 600 CV in TC 1 to qualify. The activation bar shows how much new distributor volume you've accumulated in the current month. The Go Elite Bonus bar shows how many new and old Team Members you have personally sponsored that are Elite Honors Qualified. This bar also shows the bonus amount you will earn in your next commissions payout based on how many EHQ Team Members you have sponsored. Do you have an active Autoship template? The bottom-left module will let you know. As you become an Elite Honors Qualifying professional, you will see the number of times you have qualified rise with each month you complete all EHQ requirements in the bottom-right module. Finally, are you Elite Honors qualified this month? We'll give you a straight answer in the top right corner with a green "yes" box or a red "no" box, so you will never question where you stand. You are subscribed to email updates from Synergy WorldWide Blog - United States.